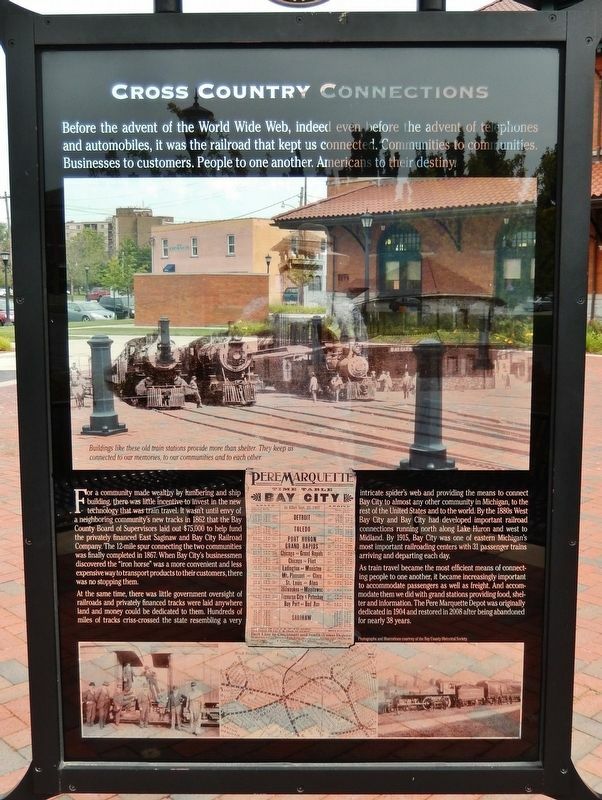 Before the advent of the World Wide Web, indeed even before the advent of telephones and automobiles, it was the railroad that kept us connected. Communities to communities. Businesses to customers. People to one another. Americans to their destiny. For a community made wealthy by lumbering and ship building, there was little incentive to invest in the new technology that was train travel. 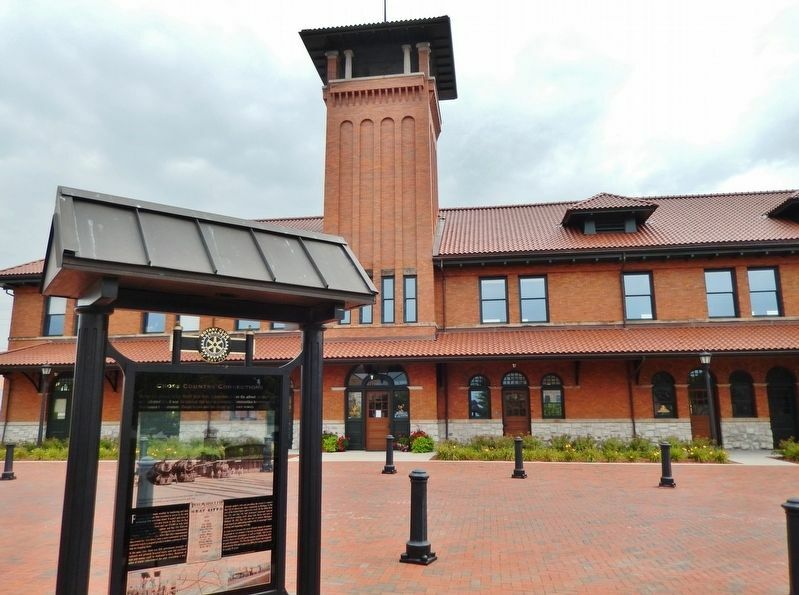 It wasn't until envy of a neighboring community’s new tracks in 1862 that the Bay County Board of Supervisors laid out $75,000 to help fund the privately financed East Saginaw and Bay City Railroad Company. The 12-mile spur connecting the two communities was finally completed in 1867. When Bay City's businessmen discovered the "iron horse" was a more convenient and less expensive way to transport products to their customers, there was no stopping them. 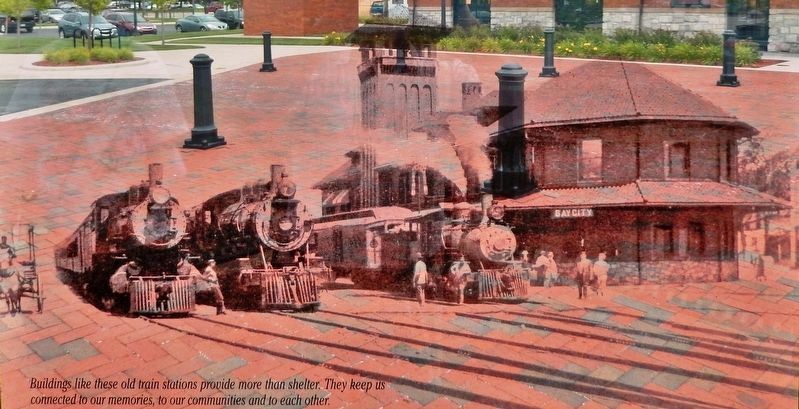 Buildings like these old train stations provide more than shelter. They keep us connected to our memories, to our communities and to each other. to almost any other community in Michigan, to the rest of the United States and to the world. By the 1880s West Bay City and Bay City had developed important railroad connections running north along Lake Huron and west to Midland. 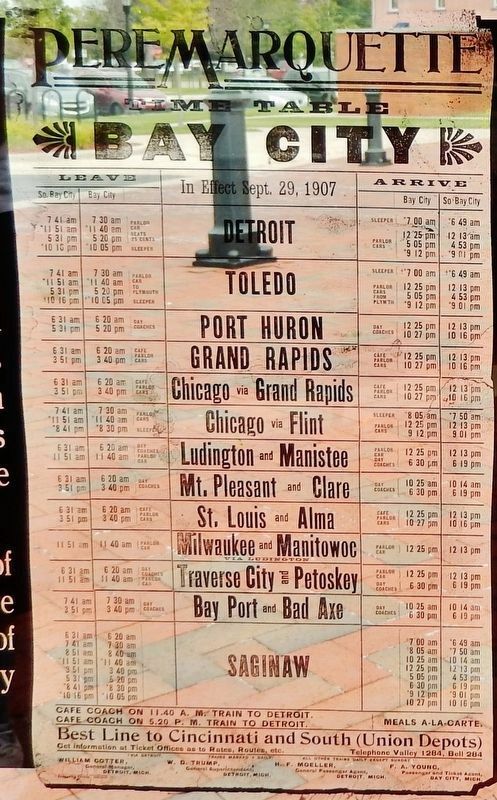 By 1915, Bay City was one of eastern Michigan's most important railroading centers with 31 passenger trains arriving and departing each day. As train travel became the most efficient means of connecting people to one another, it became increasingly important to accommodate passengers as well as freight. And accommodate them we did with grand stations providing food, shelter and information. 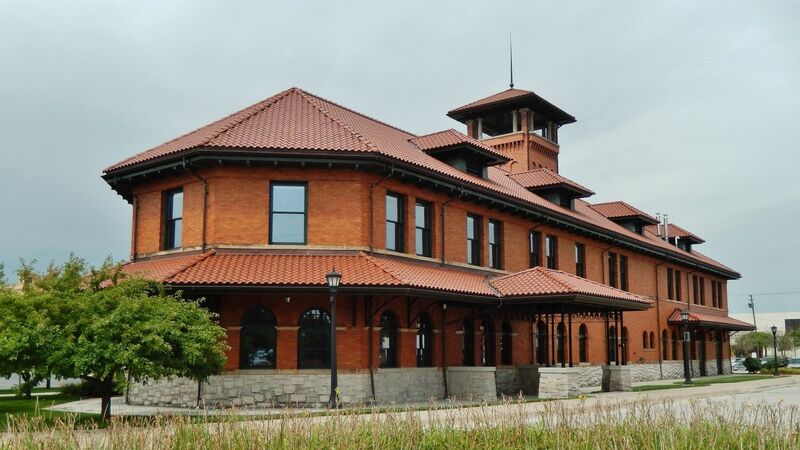 The Pere Marquette Depot was originally dedicated in 1904 and restored in 2008 after being abandoned for nearly 38 years. Erected by Rotary Club of Bay City. Location. 43° 35.993′ N, 83° 53.123′ W. Marker is in Bay City, Michigan, in Bay County. Marker can be reached from the intersection of Adams Street and 4th Street, on the right when traveling north. Touch for map. 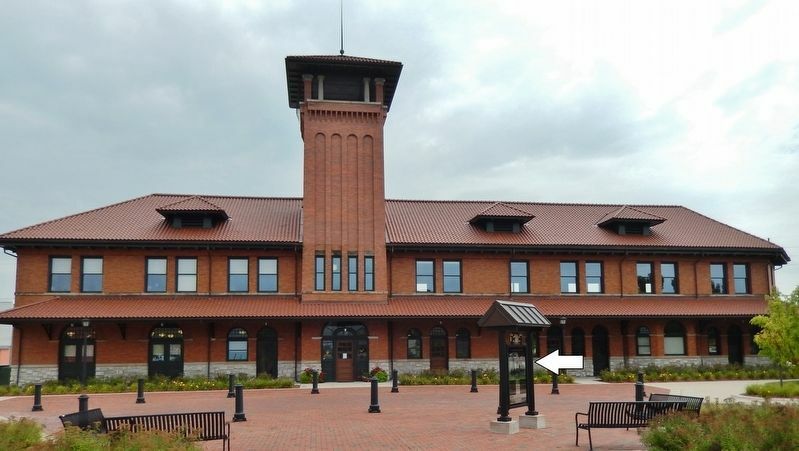 Marker is located in the plaza at the main front entrance to Bay City's Pere Marquette Depot. Marker is at or near this postal address: 1000 Adams Street, Bay City MI 48708, United States of America. Touch for directions. (approx. 0.2 miles away); First Presbyterian Church (approx. ¼ mile away); "Ten Hours or No Sawdust" (approx. ¼ mile away); Keit's Florist (approx. ¼ mile away); Trinity Church/Trinity Episcopal Church (approx. 0.3 miles away); Charles B. & Georgiana (McGraw) Curtiss House (approx. 0.3 miles away); Abraham Lincoln (approx. half a mile away). Touch for a list and map of all markers in Bay City. More. Search the internet for Cross Country Connections. Credits. This page was last revised on April 6, 2019. This page originally submitted on April 6, 2019, by Cosmos Mariner of Cape Canaveral, Florida. This page has been viewed 32 times since then. Photos: 1, 2, 3, 4, 5, 6. submitted on April 6, 2019, by Cosmos Mariner of Cape Canaveral, Florida.